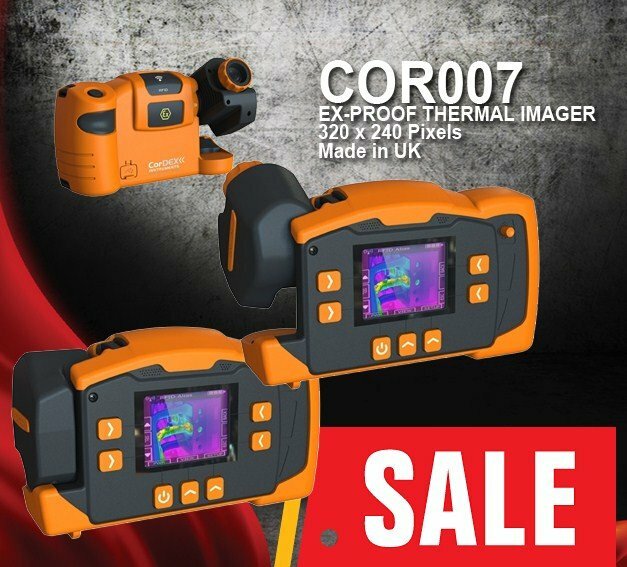 Intrinsically Safe Thermal Imager from CorDEX Instruments! The TC7000 intrinsically safe thermal imaging camera is a long awaited product by professionals working in hazardous (explosive) areas. Until now the only way to carry out thermographic inspections in these areas was with a non-certified camera and hot work permit – a risky practice frowned on by safety inspectors. TC7000 is designed for use in the explosive gas areas found in the petrochemical industry, the explosive dust areas found in sugar production and grain storage/handling and the below ground hazardous areas of the mining industry. Data capture is accurate and simple with the RFID tag reader built in to TC7000 that enables thermal images and voice comments to be linked to a location. This temperature, location and time data builds into a powerful trending and predictive tool when downloaded to CorDEX CONNECT™ software. No waiting for hot work permits with its intrinsically safe design. * Intrinsically Safe Thermal Imager may be referred to by many descriptions. An Intrinsically Safe Camera may be described as Explosion Proof, XP, IS or Zone 0 or 1. Thermal Imaging Technology may be referred as Infrared, IR or IRT. An Imager may also be referred to as a Camera. All the following are alternate descriptions for Intrinsically Safe Thermal Imager. Explosion Proof Thermal Camera. Explosion Proof IR (Infrared) Camera or Imager.